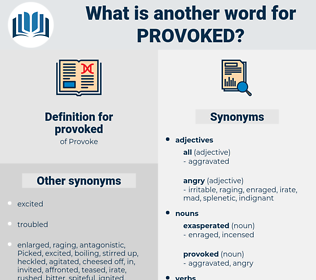 What is another word for provoked? evoked, Precipitated, Prompted, sparked, Engendered, encouraged, produced, Instigated, Promoted, Generated, erupted, triggered, inspired, elicited, angered, posed, Wreaked, Spurred, Contributed, Garnered, Occurred, facilitated, Attracted, initiated, Caught, reacted, Incurred, sustained, Created, Emerged, received, Roused, Inflicted, Brought, Arose, Ensued, earned, Caused, Killed, left, led, Detonated, Took, wrought, unleashed, forced, Resulted, Spawned, Enabled, pushing, Pushed, drew, engaged, Blew, impacted, Objected, raised, Yielded, effects, Encountered, fueled, Gave, Dragged, Became, drove, started, featured, faced, fanned, paid, pulled, Allowed, Challenged, placed, cast, HIT, touched, Launched, Meant, zu, Met, Claimed, Accounted, wanted. evoked, provocative, proved, Invoked, Prompted, sparked, pressed, Engendered, Incited, encouraged, Prevailed, produced, motivated, Instigated, Promoted, Generated, discouraged, Fomented, triggered, inspired, stimulated, Perpetrated, elicited, relieved, pressured, compelled, interlinked, leveraged, posed, observed, ignited, fostered, Deteriorated, induced, Evolved, Persuaded, Originated, harmed, Spurred, Contributed, Mobilized, expressed, Occurred, forged, excited, Necessitated, Attracted, accompanied, Underpinned, embroiled, initiated, invited, Caught, paved, Convened, activated, Urged, impelled, Incurred, Suffered, sustained, Created, Emerged, received, awakened, involved, revealed, Ushered, Arisen, Culminated, Inflicted, Brought, substantiated, Influenced, earned, Translated, fed, Caused, Captured, Been, Commenced, Followed, left, led, Entailed, Detonated, Greeted, wrought, thrown, justified, unleashed, Benefited, Undergone, Engineered, entrained, Manifested, connected, Bred, established, Achieved, Introduced, Resulted, reasoned, highlighted, Spawned, lowered, swept, drawn, Boosted, Endured, Pushed, Obtained, voiced, owed, engaged, Instituted, Learnt, impacted, combined, conducted, Sucked, dictated, formed, raised, Appealed, effected, Yielded, fuelled, Afforded, kindled, Fathered, Encountered, related, fueled, associated, uplifted, Viewed, Swayed, rooted, Dragged, Abetted, Commanded, driven, Shown, Occasioned, bound, Exacted, started, experienced, Reached, rushed, Plunged, lifted, Coached, Gained, tied, Tripped, featured, pulled, Challenged, witnessed, placed, Grounded, Waged, traced, cast, linked, touched, seen, contacted, Launched, Fought, trained, Meant, founded, Met, Claimed, done, Gotten, called. Richelieu thought that the dispute with England had been provoked by his enemies in order to break up the friendly relations which he had established. Suppose I provoked him enough to fire his pistol at me.